In line with developments in the main advanced economies, the recovery in Italy has also lost some momentum. 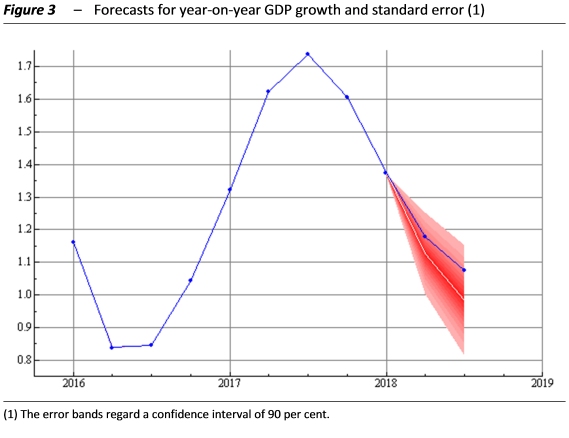 As discussed in the July Report on Recent Economic Developments, the estimates produced using the short-term models of the PBO signal a slowdown in economic activity, which could continue through the summer.This would give rise to a downward correction of growth forecasts for this year as a whole and influence, by reducing the carry-over effect, the performance in 2019 as well. The global recovery loses steam – In recent months, the global economy has shown signs of slowing, although it is uncertain whether the development is temporary or more long lasting. Inflation has risen in the euro area, and the European Central Bank announced the pace of its tapering of its quantitative easing measures. Monetary conditions will remain accommodative thanks to the policy of reinvesting the principal payments on maturing securities purchased. The components of demand linked to exports have been the most adversely affected in recent months and could also be impacted by the protectionist actions introduced or threatened by the US administration, to which that country’s commercial partners have already responded. 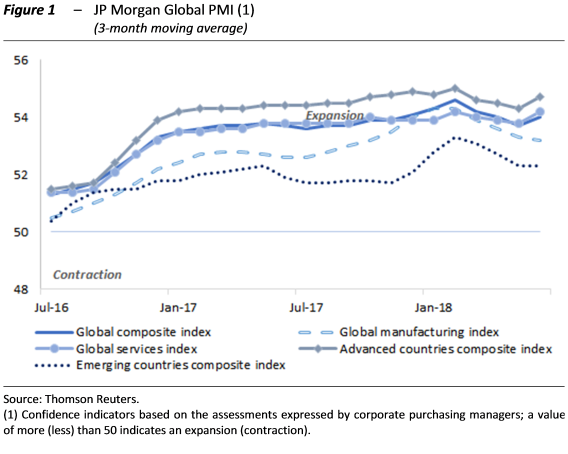 IN April-May, indicators of the confidence of purchasing managers weakened, although in June, the global composite index posted a broad partial recovery (PMI – Figure 1), lifted at the sectoral level by services. Italy is also slowing: consumption shows resilience, while investment and exports decline – Against a background of general economic weakening, Italy could not remain unaffected by the global trend. In the first few months of the year, the good performance of consumption came with a contraction in investment and exports (Figure 2). 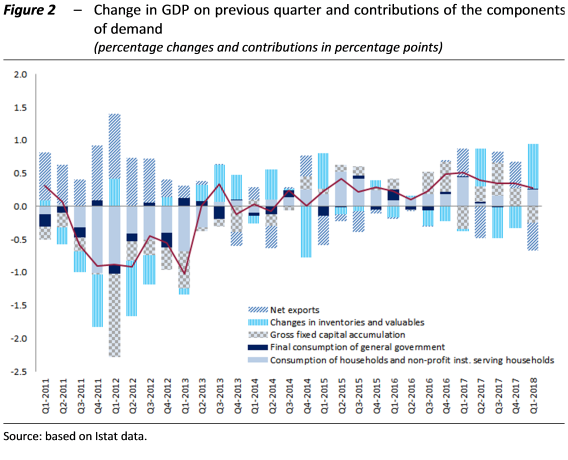 Despite a slight decline in household purchasing power (0.2 per cent in the first quarter), consumption growth recovered in the first quarter of the year (0.4 per cent on the previous period). This benefited from the of household confidence and employment growth, which in consolidating could continue to sustain household spending plans in the short term. In the first quarter gross fixed capital accumulation contracted on the previous period (by 1.4 per cent), eroding part of the gains achieved in 2017. A likely factor in the retreat was the uncertainty surrounding the extension to 2018 of tax incentives for the purchase of plant and machinery, which fell by 2.4 per cent in the first three months of 2018. The contribution of foreign trade to economic activity was also negative in the first quarter; the volume of exports, which had been expanding since mid-2016, contracted by 2.1 per cent. According to the most recent surveys on foreign orders, the short-term outlook remains weak. The confidence remains favourable but uncertainty is clouding the future – The partial cooling of output growth in recent months, signalled by various economic indicators, was reflected in industrial activity in particular (the 0.7 per cent rise in industrial production in May did not completely offset the decline recorded in April). According to the short-term forecasting models of the PBO, the GDP growth would be of 0.2 per cent in the second and third quarters (Figure 3), before strengthening in the final part of the year (0.3 per cent). For 2018 as a whole, GDP growth would therefore amount to 1.3 per cent (1.2 per cent corrected for the number of working days), slightly lower than the PBO forecast of last May (1.4 per cent). As a result of the reduction in the carry-over impact of growth on 2019 would result in a correction of the GDP growth forecast for next year as well, to just over 1 per cent. Looming over these short- and medium-term growth prospects are global risk factors that are generating uncertainty at international level and driving forecasts downwards for Italy as well. An escalation of protectionist pressures, associated with the volatility of financial markets and geo-political tensions, would adversely impact consumption and investment spending, with repercussions for the growth in overall economic activity. Employment is recovering but labour underutilisation remains considerable –According to the most recent data, labour market conditions remain generally favourable despite the stagnation of employment in the first quarter. April-May saw an increase in persons in employment (0.9 per cent compared with the first quarter), driven by fixed-term employment, as well as permanent employment and the self-employed. Over the same period the unemployment rate fell slightly, to 10.8 per cent. The underutilisation of labour in the Italian economy remains extensive, despite the increase in employment, acting as a brake on wage dynamics (in the first quarter, wage growth, measured by actual earnings, was stagnant). The underemployment rate, which in addition to the unemployed and the potential additional labour force includes those employed on part-time contracts who are willing to work more hours, decreased slightly in the first quarter but remains high (23.1 per cent; Figure 4). The divergence from pre-crisis values is largely attributable to the slow decline in unemployment.